The Hardware Café is in an old refurbished hardware store in the center of Warrenton, North Carolina. The café looks like nothing has changed, with tools hanging on the walls, not as decorations, but almost as if they’re available for purchase. The front counter where you order, and the shelves behind the counter, all look like the place where you’d converse with a hardware expert on your home improvement project. 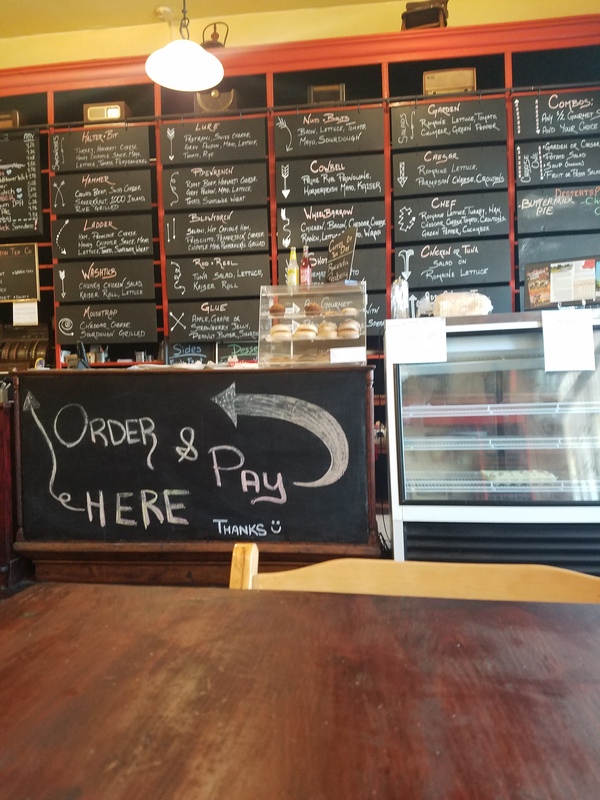 The café’s menu is even written in chalk on a number of hanging blackboards that may have once held the hardware store’s sales. And the town mirrors the café in many ways. The town is one of those small towns that is nowhere near a major city (an hour from Raleigh), doesn’t appear to have much going for it, with regards to industry, but, somehow, someway, the town thrives beautifully. The homes are all very nice, with well-kept yards, and there are no HOAs, or cheaply built kit homes by Ryan Homes, or Pulte. It’s like a perfect little town stop cold in 1983, and continued to exist happily as if nothings ever changed, or will change. Walking around the town, like sitting in the Hardware Café, wasn’t much different from those old Twilight Zone episodes, when the young stranger finds himself walking through a small town, confused, lost, only to find out that he had actually gone back in time. Maybe Warrenton is insulated, but they’re doing it the right away. Driving around North Carolina as I do, you see countless towns that are in the middle of nowhere, and they’re completely run down. Somewhere along the way, Warrenton found the right equation, balancing business, developments, farming, etc., to freeze time. When I entered the Hardware Café, I saw a sign that promoted their award winning coffee. As it was noon, and a hot summer day, I skipped the hot coffee. I had the Nuts & Bolts, their version of the Bacon, Lettuce and Tomato. Their “spin” on the classic sandwich was three slices of bread. I imagined it as simply two BLT sandwiches stacked on top of each other, and that’s essentially what I got. My only complaint is that the low BLT didn’t have quite as much as the upper BLT. In other words, when it should have been Slice, BLT, Slice, BLT, Slice, this one was a little too close to Slice, BLT, Slice…Slice. But it’s hard to screw up a BLT, and the Hardware Café did not. The Hardware Café delivered on it’s promise, a good, strong lunch, and a nostalgic flash into the past. If I’m in this area again, I’d definitely going back, to try some of their other sandwiches, or their great looking deserts, and to definitely try the coffee.